Most Westerns, one may find, tend to be large-scale epics that go on for longer than necessary. For example, films like The Searchers and the Coens’ incarnation of True Grit clock in at just under two hours, and even The Good, The Bad and The Ugly – arguably one of the most famous films of this particular genre – nears three. With this in mind, John Maclean’s Slow West – the directional debut of the award-winning short filmmaker – is a very strange beast indeed, for not only does it keep things simple and small-scale but it also doesn’t even make it to an hour and a half of screen time. Running for a mere 84 minutes, unusually short for a film of this type, it even more miraculously still manages to find the time to develop things at a brisk pace without ever relying too heavily on plot exposition or long-winded sequences of filler. You can certainly tell that it’s the director’s first feature-length movie, but it’s by far one of the most gripping ones of the past twelve months, just based on how it conveys exactly what it needs to in such a short space of time. The set-up is very simple and doesn’t require endless minutes of backstory to support it; a young aristocratic Scottish boy (the Australian Kodi Smit-McPhee, whose accent is a bit wobbly but not the worst) travels to the American mid-west to find an impoverished girl he adored (Caren Pistorius) who along with her father (Rory McCann, aka The Hound from Game of Thrones) fled the country to the USA, and teams up with a gunslinger named Silas (Michael Fassbender, reuniting with Maclean after featuring in some of his short films) who chaperones him to his destination. From there, they encounter some colourful and eccentric characters and situations while keeping their eyes on the prize, of sorts. It’s a very basic set-up, and Maclean doesn’t waste time in moving stuff forward right when it needs to; he seems to understand the importance of his story over the type of filler sub-plots that most other films like this tend to overuse. He also recognises that even a film as strange and bleak as this needs a few lighter-hearted moments, and he compliments this necessity by placing in some inspired moments of pitch-black comedy during the most unexpected moments. One particular sight gag that Fassbender and Smit-McPhee come across at one point is as if it came straight out of a Bugs Bunny cartoon, right down to the victim’s position, and while it is a pretty funny visual it also comes with a very harsh context that you start to feel a little guilty for laughing like you did; another comes in the final climactic shoot-out (because what’s a Western without a climactic shoot-out? ), which comes at the expense of a major character that – quite literally, and hilariously tragic to boot – serves to pour more salt in the wound. It all makes you realise what a harsh and simultaneously giddy place this is, at least in the mind of its director, and thanks to his swift pacing and concentrated direction along with detours that move toward the absurd, he gives his own film a complimentary nod to the filmography of Joel and Ethan Coen. Maclean also manages to homage some of the Coens’ style without entirely ripping it off; a random encounter with a mysterious traveller in the middle of nowhere exhibits just the right amount of eccentricity to make you wonder more about this strange person, and a campfire story about an outlaw and his own “wanted” poster is given a playful visual backdrop that brings out the best in both filmmakers. If anything, it’s a loving tribute rather than a budgetary rip-off. Visually, it is simply gorgeous – with New Zealand doubling for the Colorado landscape, Maclean and cinematographer Robbie Ryan take full advantage of its scenery to create something right out of a fairy tale, and when it’s not being that it harbours an excellent atmospheric environment to further establish the unsuspectingly harsh world that our characters have entered into. An earlier scene in particular which sees an attempted robbery in a small store gives off a claustrophobic and eerily spacey vibe, all the while creating a the right amount of tension that leaves you on the edge of your seat. If all of that wasn’t enough to make you see Slow West, just remember; all of this is conveyed wonderfully in under an hour and a half. Now THAT’s impressive. 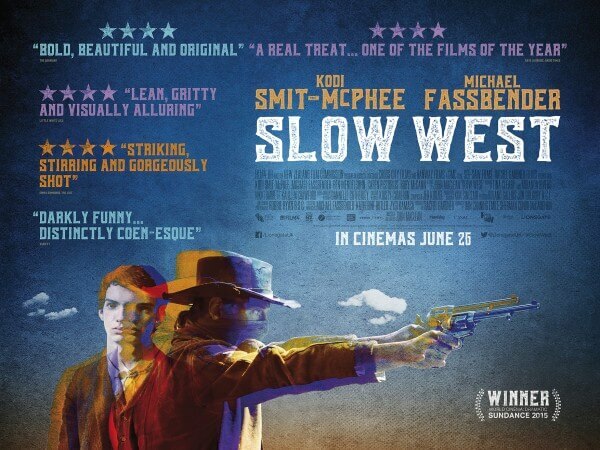 Slow West, at 84 minutes, may be short but it uses its time accordingly by establishing an amusingly dark and beautifully shot atmosphere, with various bits of Coen-esque humour thrown in while also establishing director John Maclean as a future director to watch, if this is anything to go by.